Our product range includes a wide range of woven courier bags. Ispa Exim provides non woven courier bags from 50 GSM - 200 GSM in different specifications. We manufacture courier bags from high quality PP woven fabric film material. These qualitative durable courier bags are used for courier, express and mail services. Packaging is done as per the specification of our clients. 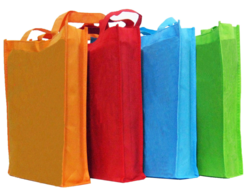 Looking for Non Woven Courier Bags ?